An emergency meeting was held on Sunday afternoon for Church leaders at the St. Newmarket Church to explain to their congregation why a “satanic” metal band’s music was performed during the Easter service. 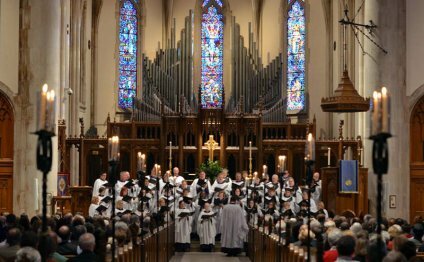 The St. Newmarket church choir in Princeton, Illinois mistakenly performed Lamb of God’s “Walk With Me In Hell” during the packed Easter service. Church leaders immediately fired Larry Stevenson, the choir director at the church. Several witnesses to the embarrassing oversight reported at least one person passing out during the performance after the realization that the music was “satanic” in nature. Other Church members called for the immediate termination of Church director Kevin Lester. These are the words echoed by the choir during the packed service. The choir director stated he believed it was a christian song about “togetherness and faith”. Eastern Star Church Choir-" The Lord is Blessing Me"